Heroes in Hell is a sustained fantasy series that began in the 1980's, continue today, and is welcome to all (it is always a good time to go to Hell). Doctors in Hell is an enjoyable introduction to Hell which serves as a great entry point to the series introduced us to Daemon Grim, which spawned a Grim-focused novel: Hell Bound. Now Grim returns again with Hell Hounds, on Amazon now (preorder until October 25, 2017). within the genre Bangsian horror/fantasy, created and edited by Janet Morris and written by her, Chris Morris, C. J. Cherryh and others. The first 12 novels in the saga were published by Baen Books between 1986 and 1989, and stories from the series include both Hugo Award winners and Nebula Award nominees. The series was resurrected in 2011 by Janet Morris with the thirteenth book and eighth anthology in the series, Lawyers in Hell, followed by six more anthologies and three novels between 2012 and 2017. The shared world premise of Heroes in Hell (also called The Damned Saga) is that all the dead wind up together in Hell, where they pick up where they left off when still alive. The Encyclopedia of Fantasystates "In the long series of shared world adventures begun with Heroes in Hell, Hell becomes an arena in which all the interesting villains in history can come together to continue the relentless pursuit of their various ends.” Brian Stableford commented that the series "adapted the backcloth of Dantean fantasy as a stage for violent adventures with ironic echoes of infernal comedy. You should be. Just think of what you could do with such a concept, where dastardly deeds, despicable desires and dark secrets are stirred to fruition and laid bare for your inspection. No wonder the series continues to go from strength to strength. And do you know what? The Heroes in Hell Universe continues to expand. If you remember, Doctors in Hell, published in 2015, introduced us to Satan’s go-to guy in times of trouble, the Goth of Goth’s, Daemon Grim – who just so happens to be none other than the Reaper himself. Fans of the series were delighted when Grim went on to star in his very own HIH adventure – Hell Bound. In Hell Bound, we met some of the foulest scum ever to have existed, and the book went on to become an international #1 hit. So much so, that the fans have clamored for more ever since. Well, you’ll be glad to know the sequel has arrived. Entitled Hell Hounds, much of the action takes place in the underworld’s version of Paris – or Perish as the damned like to say – a place where joie de vivre is replaced by joie de la mort. Having eliminated a major player in the uprising eating its way like a cancer through the underbelly of hell, Grim is stunned to discover he cannot afford to rest on his laurels, for the rebellion runs far deeper than was ever imagined. New players have emerged – denizens with uncanny abilities – who seem determined to support Chopin and Tesla’s revolutionary agenda. Ever keen to test their mettle, the Sibitti – personified weapons of the ancient Babylonian plague god, Erra – also appear eager to capitalize on the growing unrest, and set about maneuvering events in order to place themselves in direct opposition to Grim’s investigation. And if that was not cause for concern enough, there’s an insane angel on the loose, a creature as hell-bent on creating havoc as he is to return home. 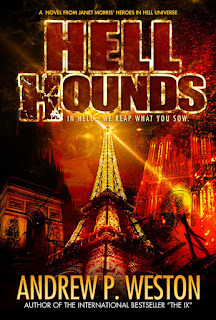 Hell Hounds – We Reap What You Sow. An astronomy and law graduate, he writes stories that transform strange dreams into twisted reality and is the author of the international number one bestselling IX Series (The IX and Exordium of Tears) and creator of Daemon Grim, Hell’s gothic hero of misadventure. A member of the Science Fiction and Fantasy Writers of America, the British Fantasy Society and the International Association of Media Tie-In Writers, Andrew has a keen interest in the paranormal, and devotes some of his spare time to assisting NASA with one of their remote research projects and writing educational articles for Astronaut.com and Amazing Stories.